On one of our normal work days, our office received a sudden call from LTA requesting for assistance to recover a toppled dump truck inside a tunnel. Realising the urgency of this job, our Office immediately dispatched our Surveyor to the site to understand the site situation and to come up with the best and safest way of recovering the vehicle. There were many difficulties surrounding this recovery job. First of all, the tunnel is low and this makes it hard for our crane to “lift” the whole vehicle up, without hitting the ceiling. Secondly, there was a space constrain as LTA still wants to keep traffic flowing. This means our vehicle cannot park at the intended distance from the truck to execute the lifting job. 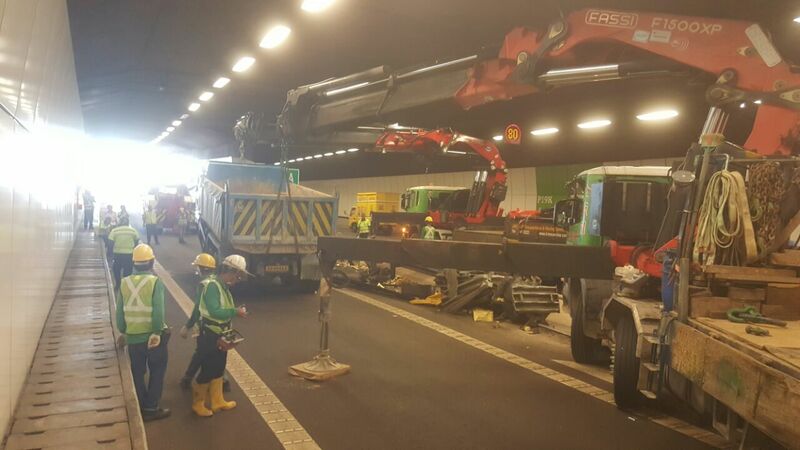 Lastly, the job has to be done quickly as the tunnel was already jammed with vehicles and the time then was approaching “After Office peak hour”, which will see even more vehicles travelling into the tunnel. Our surveyor determined that the safest and quickest way to recover this truck is to engage 2 Huge lorry cranes, parked at each corner of the toppled truck to “pull” it out from its current position. By pulling, this will ensure that the crane boom does not hit the ceiling of the tunnel. And to ensure safety, lifting personnels from Kim Soon Lee were called down to coordinate and perform the whole recovery job. Our vehicles and men arrived at site within 1 hour of activation. With great precision and speed, the whole recovery was done in about 45 minutes, in accordance to the planned method. The damaged dump truck was towed away from the scene at 330pm, before the “After Office peak hour”, and to the relief of everyone there. Erection and positioning of Telecommunication servers in designated buildings throughout Singapore, estimated to total 1,000 sites in all. The project involves the using of big cranes to hoist servers onto rooftops and machineries such as forklifts to skid them into underground carparks. 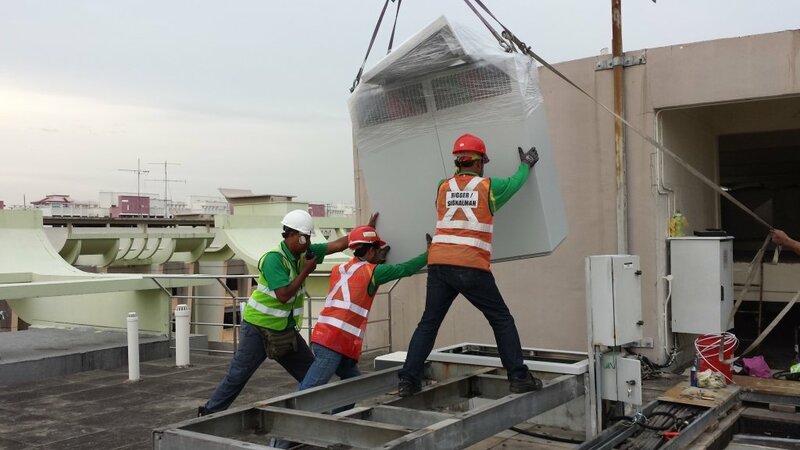 All sites involved are in built-up areas such as HDB flats, condominiums, flatted factories, shopping centres and hotels where space is always a problem. As such, the greatest challenge is often to select the most appropriate crane or machinery to be used to perform the job while minimizing their take-up space. Our Project Team work tirelessly to ensure the smooth execution of this project – from site surveys to actual planning, from drafting of plans to their endorsement by the Professional Engineers, and from application of jobs to the relevant government authorities to the actual operation itself. Over the years, Kim Soon Lee, with its fleet of air suspension flatbed and lowbed trailers has become renowned for the transportation of air craft engines. 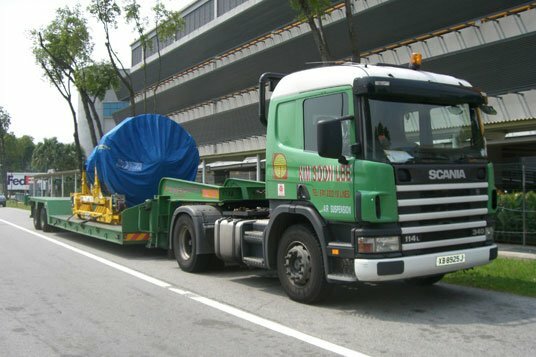 Having a yard at Bedok allow us to cater to last minute delivery requirements while our ability to lift and transport them by our own tailoured-made equipment, rid customers of the trouble which otherwise they have to experience while coordinating such jobs.